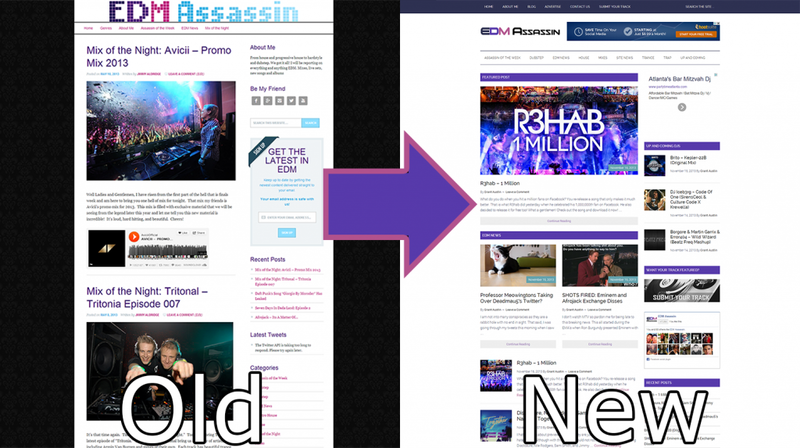 You are here: Home / News / EDM News / Site News / Welcome to the New EDM Assassin! Welcome to the New EDM Assassin! It makes me extremely happy to write this post today to introduce you to the new EDM Assassin. For the past month, I have been working extremely hard to create the new look, come up with ideal setup, and getting this site up-and-running with the new look and features. 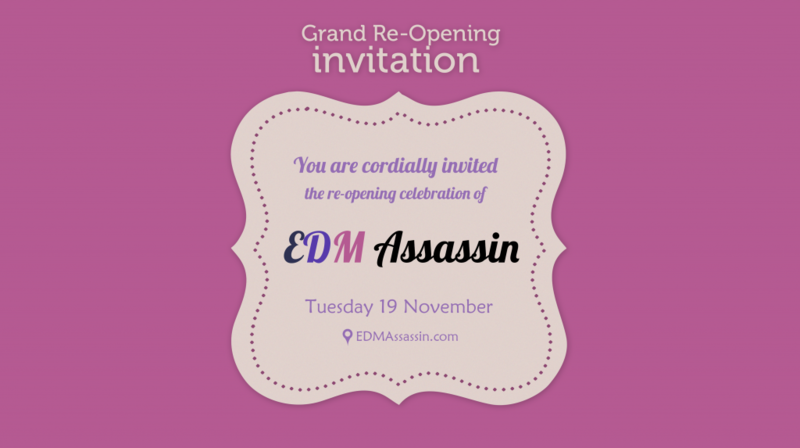 On October 26th, I took over EDM Assassin and pledged I would work on a number of things. I can say officially that I made sure to cover each and everything I mentioned in the list. Let me go over what I said I would do and how I implemented it on this site. New content! I honestly love the music and am willing to dedicate some time every day to this blog. In between work, school, and the gym, I can dedicate at least an hour or so between things so I can get to you the latest music and news in the EDM world. New Site Design! Cool thing about creating the site means I can redo the site any time I want. Over the next week(s), I shall be redesigning this site to give it a brand new look, yet keeping the same awesomeness that you know and love. Interaction! I believe in PLUR and I believe in the motto of Swedish House Mafia: We Came, We Raved, We Loved. I want to try and boost Twitter interaction, Comments, Facebook page. Up and Coming! One of the biggest things I loved about this blog was Jimmy included user created content aka your stuff. It wasn’t just about Hardwell or Armin Van Buuren, but it was about the music you created and if you submit through the site so I can have all the information, I’ll start posting it. The Team! I will be looking for individuals such as yourself to help me with this blog whether it is promoting or writing. It is simple. Just contact me through the site. I’ll give you instructions and you can join The Order. New Content – As you can tell, I have been updating this site very frequently. There are anywhere from 8 to 24 articles in a day and this is just the start. I have been including news about artists, their new music, albums, EP’s, tours, and more. Anything that I feel has value to you all, I have been researching and posting. The way I report to you the new posts have been through our Twitter Account, Facebook Page, Mailing List, RSS Feed, and as of recently posting on Soundcloud of the songs I have wrote about. I also worked on fixing the Submit Your Music form so I could be able to have a full understanding on who you are, what you are submitting, and what you want to see out of the post. New Site Design – If you haven’t realized yet, we are currently running a complete new look. From top to bottom, I redesigned everything to be optimal and aesthetically pleasing to all of you. The homepage serves more as a homepage rather than a blog. The top is the latest post while the middle is the latest EDM news, and the bottom is all the new music. On the sidebar, you can see up-and-coming DJ’s work, recent posts, the Facebook Page, and more. I felt that putting the up-and-coming work on the sidebar gives these guys more of an ability to be found as this is featured on every page. To see all the posts, you simply just need to check out the blog or any of the categories listed above. The search bar at the very top works well too. When you view posts, there is related posts that provide similar posts to what you are viewing. The best part is if you look at the old and look at the new, I kept the same color scheme, but redid it. I wanted to keep something from the old look and bring it to the new look. Interaction – This is something that I feel big upon. What is a site where I post new things, but don’t talk to those viewing my site. I want people to be able to talk to me, comment on blogs, tweet, and Facebook message me. If you don’t already know, I make it a point to welcome all new Twitter followers because it is at the point where I haven’t lost control. I also try to interact with everyone who mentions me as well as those who help spread the word of EDM Assassin. I can’t quite say the same about Facebook as the growth there isn’t comparable to Twitter. That said, I am working hard to resolve that issue because I believe both social networks are very important. Up-And-Coming DJ’s! – I have done a lot for you guys not because I have to, but because I want to. Many of you have submitted your music via Twitter, Facebook, and the Submit Your Music page. I am quite astonished by the music you put out. While I am not the professional connoisseur I wish to be, I do know what I like and dislike. Up till now, I held back from posting many Up-And-Coming work because I wanted this to be announced. Now that I am announcing the new EDM Assassin, I am 100% taking new submissions for music. While I prefer you submit via the Submit Your Track page (essentially makes sure I don’t forget to post as well as makes sure I get all the details right), I will accept via email, Facebook and Twitter. As already stated, when I post your music, you will be featured at the top (as long as you are the latest post), the music section via the genre you made, and the Up-and-Coming section on the sidebar which lists the latest 3 tracks. All of these tracks will also be posted to the EDM Assassin Facebook page and Twitter. The Team – This is something that I haven’t been successful in achieving, yet. I am still looking for individuals to help me out promoting this blog or writing for the blog. It is simple to do and I’ll show you everything you need. Essentially, as long as you’re literate and able to follow the few directions needed to make a post, you’ll be golden. All you have to do is click the Contact Us button, fill out the information, and you can possibly join The Order (what we call ourselves me). Other Notes – Along with the site, I have also redid the look for our Twitter and Facebook page. They had a monogamous look before and they still do, but this time with the new logo as well as a new background to match this site. Overall – Jimmy started this site and with my guidance and his hard work, he was able to take this site to amazing lengths in such a short time. Unfortunately, he didn’t stick with it and I intend to break those boundaries and go above and beyond any possible limitations. Like I said when I took over this site, I love this site and I love you guys. I want this site to evolve into something bigger and better and with the help of all my assassins (you all). Remember, we are here to promote the music and the good times.